Email us or see our FAQ Page. Buy more, save more! Flat rate ground shipping is just $6.95 for any size order. Business days are Monday through Friday - excludes weekends and holidays. *Standard - Estimated arrival within 3-9 business days depending upon your location. Your package will arrive at your regional postal center within a few days then may take up to 2 weeks for your local post office to deliver it. Please allow for the full delivery time and be sure to enter your post office mailing address as your shipping address. The map above shows the normal time-in-transit for UPS ground shipments made from our facility in Livermore, CA, in the San Francisco Bay Area, to physical street addresses (non-P.O. box) in the U.S. UPS does not deliver to P.O. boxes. We do not ship to UPS stores or similar types of locations. Business days exclude weekends and holidays. *Standard Shipping Times Not Guaranteed - may take up to 3 weeks for delivery. Please allow for the full delivery time. **UPS Ground drops to a lower flat rate of $6.95 for orders over two pounds or $150. Above delivery dates do not apply to orders shipping by USPS - P.O. Boxes, Alaska, Hawaii, and Canadian addresses. UPS 2 Day and 3 Day packages shipped on 12/19 will take an extra day for delivery (so 2 Day orders will arrive 12/22 and 3 Day orders will arrive 12/26. UPS requires a physical street address for deliveries; Economy requires a mailing address. UPS does not deliver on weekends or holidays unless you upgrade to premium Saturday delivery service. Call 1-800-551-5953 to inquire. UPS does not reimburse shipping for weather-caused delays. To have driver leave your package, request a Shipper Release in the order notes section during checkout. *UPS Ground Shipments Not Guaranteed Between December 11th and December 24th. **Standard - Estimated arrival within 3-9 business days depending upon your location, however it may take longer around postal holidays and during high volume periods. Your package will arrive at your regional postal center within a few days then may take up to 2 weeks for your local post office to deliver it. Please allow for the full delivery time and be sure to enter your post office mailing address as your shipping address. ***UPS 3 Day and 2 Day shipping dates are extended by one business day the week before Christmas through New Year's Day. 3 Day orders placed on Monday 12/17/18 will be scheduled for delivery on Friday 12/21/18. 2 Day orders placed on Tuesday 12/18/18 will be scheduled for delivery on Friday 12/21/18, etc. Safe Online Ordering: 24 hours a day, 7 days a week. Our site has strong SSL Encryption to ensure your information is always protected and never compromised. Click the lock icon in the browser from secure checkout pages to confirm our site's security. 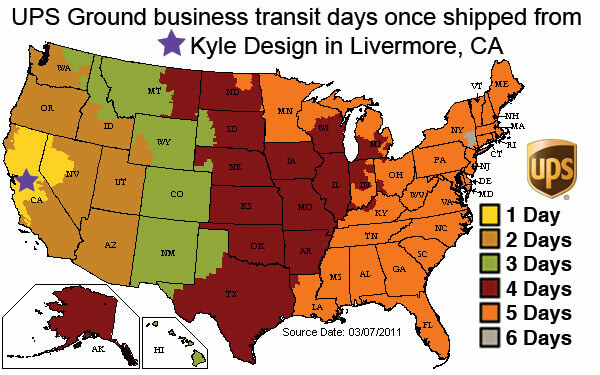 Kyle Design ships to the US and Canada. You may pay with Visa, MasterCard, Discover, American Express, or PayPal. Kyle Design does not offer or solicit gift cards, promotional codes, or coupons. Please note that special ordered items, special order quantities, engraved items, and items damaged after receipt are ineligible for return or exchange. To learn more about our returns and exchange process, please visit guarantee & returns. See the FAQ page for more answers. For most orders shipped within the continental US, you may choose standard economy shipping for $6.95 per order or UPS Ground delivery at a flat rate of $10.95. Our low cost shipping is a great value - fast, safe, and secure. Your order is always trackable, insured, and shipped in a sturdy box to protect the integrity of your item. See Shipping for more details. For Canada, Hawaii, Alaska and PO Box addresses, your order will be shipped via USPS. 2. Can I cancel, add to or change an order I've already placed? 3. Can I return or exchange my purchase? Kyle Design - Return/Exchange Dept. *Please note that special ordered items, engraved items, and pieces damaged after receipt are not eligible for returns or exchange credit. 4. Is the item I want to order available in stock? 5. Why is my item on backorder? If one or more items are unavailable to ship immediately, these items are "backordered" and will ship at a later date. You will be provided with an approximate ship date for your order as soon as possible. Please be aware that backorder dates are approximate and subject to change. Your order will be processed within 1 to 2 business days with the exception of the holiday season when shipping times may be extended. See the UPS transit map below for the approximate shipping time expected for your order. 7. Do you have a printed Kyle Design catalog? We offer thousands of items on our website and maintain it daily to offer the most up-to-date information on the products we offer. Because information and availability changes daily, we do not have a printed Kyle Design catalog.